InFaith is moved by the call to reach locally and spread God's kingdom right here in the United States. InFaith is moved by the call to reach locally right here in the United States. We want to be a part of God's change in others even as God is constantly changing us. We try to find the dark places in our local communities and see where Jesus needs to shine by calling people to conversion and discipling them in their walk of faith. We visit the prisoner and the widow. We clothe the naked and feed the hungry. We participate in God's work in our local communities to bring about God's vision for "on earth as it is in heaven" (Matthew 6:10). We believe that Jesus changes everything He touches. And we believe that He uses our hands to bring about that change. Our country is full of people who are struggling with physical needs, who are lonely and confused and searching—who need hope. And we have the greatest hope of all—Jesus. InFaith is built upon the Word of God and our personal faith in Jesus Christ. We hold to the great foundational truths of the historic Christian faith held in common by like-minded evangelical Christians with whom we share the mission mandate. Our statement of faith and ministry essentials, which are the core values that help to define how we approach ministry, are found here. InFaith is moved by the call to reach locally and spread God's kingdom right here in the United States—something we've been doing for the last 200 years. Though we have roots going back to 1790, our organization was officially formed on May 13, 1817 and called itself the Sunday and Adult School Union. Through the years we've had several name changes from American Sunday School Union to American Missionary Fellowship, to our current name of InFaith. But through it all, we have been reaching locally here in the United States to teach the unchanging truth of God to an ever-changing culture. 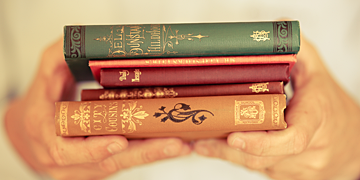 Learn more about our mission's heritage here. 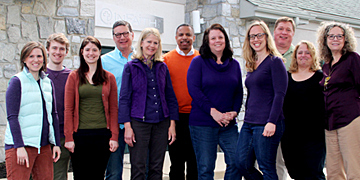 InFaith's governing body of the ministry is the Board of Trustees. They stop any theological or organizational drift from the Statement of Faith and of common historic practices of the ministry. Read their bios. The leadership of the mission is shared by a management team. This team assures that the missionaries are valued, supported, and have an appropriate spiritual covering. 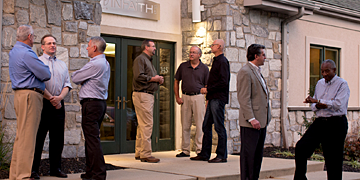 The management team is responsible for the day-to-day operations of InFaith. Read their bios.